I would have thought 50606 was a 1989 Bass. The serial must not be chronological order. Can you remember which date was on the neck and which was on the body? awwww.... she finally has a birthday I can celebrate!! I know it's only about 3 years old as I bought it from the original owner who special ordered it from Sam Ash because they worked there. barkatozz...yours is an early 2002. Hopefully Derek will spot the mistake in the serial you gave him. Yeah was a bit ecstatic about getting it when I made the post.....OOPS! july 28th 1983 in neck pocket. Sorry, but I missed your original reply. Thanks for looking them up! And a bunch of non-EBMM stuff! 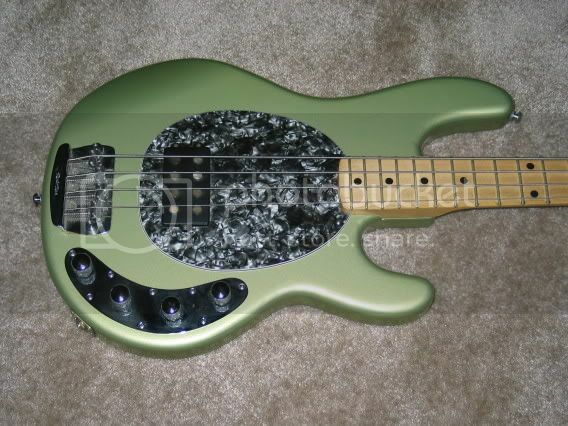 Just bought a Honeyburst unlined fretless, white pickguard. I love it! Serial number 08151, six screw neckplate with the old logo. This seriel number does not show up in our system. Can you doublecheck. Just checked, there was a D nestling under a saddle that I'd missed. I'm impressed. What sort of birthday cake do fretless SR4s like?